Now that I’m back in music school, there are a few flute bag necessities that I like to keep on hand. From instruments to accessories, I keep quite a bit of stuff in my flute bag. You might have different necessities than me, and that’s okay. I’m sharing my flute bag necessities to give you some inspiration for what to keep in your bag. Even if you’re not a flutist, many of these items will apply to you. As a graduate flute student, I need to keep a couple of instruments on hand at all times. The two instruments I always have in my bag are my flute and my piccolo. The most important thing in my flute bag is, obviously, my flute! I recently upgraded to a professional flute, and it has made a difference in the six months I’ve had it. Whether I’m at school for rehearsals, a lesson, or a class, I make sure I have my flute. Of course, I need my flute for lessons and rehearsals. But there is one day a week where I just have one academic class. Even when I “just” have class, I still like to take my flute. Sometimes, I will get to school early just to get a decent parking spot. I don’t want to just sit around until class. So I’ll go find a practice room. While I’m not playing a ton of piccolo right now, it’s a very real possibility. I am playing piccolo on one piece in orchestra for sure. As a flutist, I need to have a piccolo on hand in case I need to cover a part. Also, I try to keep piccolo practice at home to a minimum. Piccolos are small, so it just makes sense to keep mine in my backpack. Not to mention that I really like the piccolo. Accessories make up the bulk of my flute bag. Of course, I need my instruments, but accessories are important too. At home, I have a couple of heavy duty flute stands, but I don’t like lugging them around in my bag. That’s why I have a small flute stand and a small piccolo stand. On the go, I use a Hercules Travelite Flute Stand and a K&M piccolo stand. Both stands are compact, and they’re easy to assemble and disassemble. I use my flute stand almost any time that I have my flute out, except for lessons. If I’m playing piccolo in a practice room, I usually just rest it on top of my piccolo case. For rehearsals, I definitely use my piccolo stand. For both flute and piccolo, I prefer to use a stand rather than resting them on a chair. I just don’t think a chair is all that safe. While these stands aren’t as sturdy as the ones I have at home, they’re better than a chair or the floor. This past August, I finally bought a physical tuner and metronome. I have a couple of tuner and metronome apps on my phone which is great. There are a few benefits to having a physical tuner and metronome. First, if I need to tune during a rehearsal, I can keep my phone in my bag. That way, I won’t get distracted by social media or text messages. My favorite benefit is that my tuner and metronome came with a special cord. I can connect the cord into the tuner and then other end hooks onto my flute or piccolo. The cord will only pick up the vibrations from my instrument. When I’m trying to tune before a rehearsal, my phone picks up different sounds around me. The cord solves that problem so that I can make sure I’m in tune. Pencils are probably the most important accessory for all musicians. If you need to mark on your music, you don’t want to do it in pen. Sometimes, you have to play on rented parts. Other times, you may want to change something later. Whether you own the music or not, you should be able to erase any marks you make. There are some erasable pens, but pencils are much better. This one’s for the piccolo players. I’m sure everyone knows the piccolo can be loud and piercing. If you play piccolo at all, you need earplugs. I have found that I can play piccolo more confidently with earplugs because I don’t feel like I have to protect my ears. If you play another loud instrument, or you sit next to one in an ensemble, you should consider a pair of earplugs. You don’t have to spend a ton of money to get a good pair, and they will be your best friend. Lately, I have been using my iPad mini for sheet music. I still primarily use print music, but the future is here. More and more musicians are switching to digital copies of sheet music. I mostly use my iPad for sight reading, but I’ve started to use it for some etudes and exercises. Once I get more comfortable with it, I will probably upgrade to a newer iPad with a larger screen. The small screen on the iPad mini isn’t great for long term practicing. What are some flute bag necessities of yours? Do you keep the same things as me? 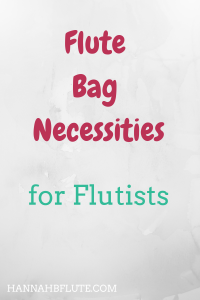 Do you have different flute bag necessities? Let me know in the comments!